Today’s economic news adds another number to a long list of numbers pointing toward a tepid recovery. GDP grew at an annualized rate of just 1.5 percent in the second quarter, which is about halfway between healthy post-recession growth and a double dip recession. Put differently, it’s more or less what you could have guessed based on meager job growth, a steady stock market, or the sense that things aren’t exactly rapidly improving or falling apart. According to the opinion machines, this is bad news for the president. But is it bad enough to cost him reelection? As an empirical matter, the answer is: possibly. Second quarter economic growth figures prominently in political science election forecasting—it’s one of the core variables in fundamentals-based forecasting models, including the prominent Abramowitz model, renowned for predicting the winner of the popular vote in every election since whenever. 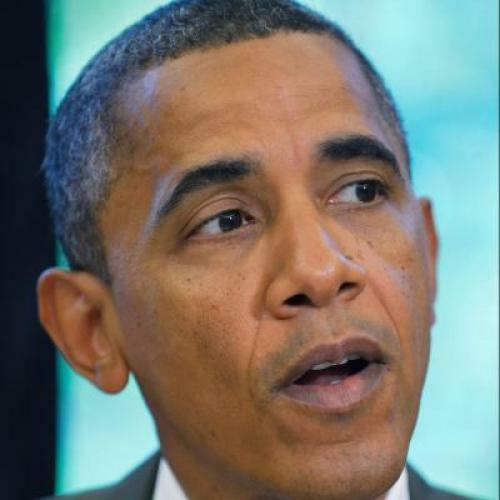 So what does 1.5 percent second quarter economic growth mean for 2012? Well, it means a close election. According to the recently modified iteration of the Abramowitz model, Obama should receive about 50.5 percent of the two-party popular vote—enough to barely win reelection. But that conclusion shouldn’t leave Democrats elated or Republicans despondent. The relationship between economic growth and electoral outcomes is imperfect, and there’s a much larger margin of error than reporting might lead you to believe. Consider this graph of Q2 GDP growth and the result of the Presidential election. 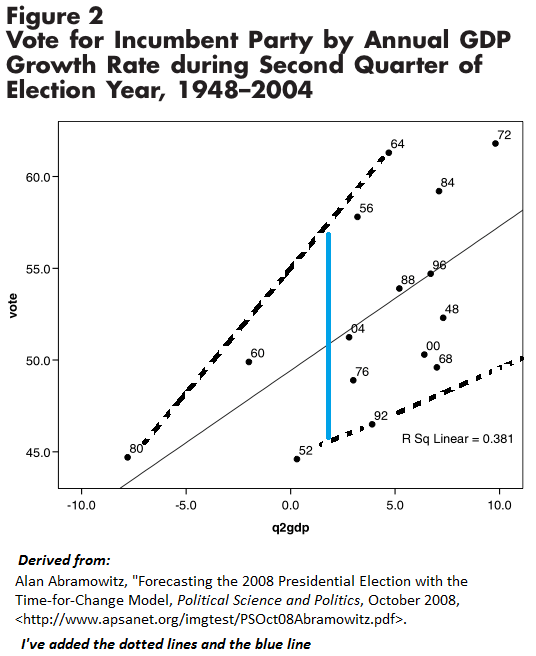 As you can see, results often fall far from the best fit-line, which I've tried to illustrate by adding a highly unscientific dotted line linking outlying election results, and a blue vertical line indicating the wide swath of possible outcomes at the current rate of economic growth. Notice that the relationship between economic growth and a successful reelection is far from perfect. GDP growth was higher for Bush 41 than Bush 43, yet it was W who narrowly won reelection. In the opposite direction, economic growth in 1956 wasn't too far off of 2004, yet Eisenhower won by 15 points in the national popular vote. Now, political scientists attempt to account for these deviations by introducing other variables, like incumbency, polarization, job approval ratings, or even additional economic metrics with varying degrees of success. But the point is that this economic performance doesn't assure either side of victory. Nor are the numbers so notable that they might be expected to change the horserace. 1.5 percent GDP growth is thoroughly mediocre, but that means the news aligns with existing public perceptions. If the numbers pointed toward a double dip or signs of renewed economic vigor, perhaps Obama or Romney would benefit. But as it is, today's data suggests we should expect the race to continue along the road it was already traveling, regardless of whether we're heading toward an Obama or Romney victory. The fundamentals point toward an extremely close race. The President’s net-approval rating has bounced within one or two points on either side of zero since January and tepid GDP and job growth is highly consistent with a closely contested national election. But even if the fundamentals represent 95 percent of election outcomes, there’s plenty of room for either side to emerge victorious, at least in this election.